After horror author, Lily Grey, has a bad experience in the city of Atlanta, she moves to a small town on the Florida panhandle, Eden Beach. Little does she know, this small town has dark secrets and a history of violence. Lily finds herself attracted to the sheriff, Rob Vega, but he seems to be dealing with his own demons. As she does more research on the town, she is horrified, yet fascinated by the murders committed in this deceptively pleasant little town. Lily learns more from a preacher she meets in a little church on the beach, but she knows he is hiding something, too. She soon realizes she is in danger, and even though the sheriff would do anything in his power to protect her, there are powerful forces at work. Will Lily and Rob be able to overcome the evil that lurks in this little town? Or will Lily fall prey to the Hearts of Evil? This book is full of mystery, horror, and the supernatural with a little romance thrown in. Levi Parker poured himself another shot of Scotch and walked unsteadily to the window overlooking his lush lawn. Although it was only eleven o’clock in the morning, he deserved a drink. Several drinks. After the letter from his bank announcing the foreclosure of his house as well as his car dealership, he deserved to get stinking drunk. How was he going to tell his wife? She knew nothing about the gambling debts he had to pay, nor his payments to the numerous prostitutes he had shared a bed with. Not to mention the extra money he had to pay the pimps when he roughed one of the girls up from time to time. He surveyed his property, and felt such a pang of regret, he swallowed the whiskey down in one gulp and went for another. He was going to lose it all, and none of his extra-curricular activities had been worth it in the long run. Had they? It wasn’t long before he was so inebriated he could barely stand. He plopped himself down in his oversized armchair…another possession he would miss…and quickly fell asleep, his glass slipping out of his hand and making a thud loud enough for his wife to come and see what had happened. He didn’t see her move silently into the room, nor did he see the sadness that came over her face as she looked at him before walking back out the door. As Levi slowly came awake, he saw it was almost dark in the room, shadows lurking in the corners, causing him to shiver. Then one of the shadows broke away and moved closer to his chair. Standing before him was something out of a nightmare, a creature made of black smoke with eyes that burned red as fire. “Wh…what….” was all that would come out of Levi’s mouth. “What am I? Who am I?” the creature said, laughing, the sound like something from the deepest pits of hell. The creature moved closer, and Levi shrank away as much as he could in the chair. He hoped he would wake up soon because this was the worst nightmare he had ever had. Levi found himself nodding. After all, if this creature could give him back what was about to be taken from him, it didn’t really matter what he needed to do. He would do it. The creature rumbled in laughter again, and Levi’s fear threatened to overtake him again. But, no, he wouldn’t quake in terror. He had to find out what would restore him back to the comfort he deserved. “Very well.” Then the creature moved closer and whispered in his ear. Levi leapt up from his chair, awake and fully sober. What had happened? Then the dream came back to him in all its horror and fascination. He felt an uneasy, unfamiliar stab of guilt in his gut, but he pushed it down. He knew what he had to do. He was a survivor. He called his wife’s name, and she came down the stairs in her robe, frowning at him. She wasn’t used to being summoned this way. In fact, she wasn’t used to being summoned at all, considering he ignored her most of the time. 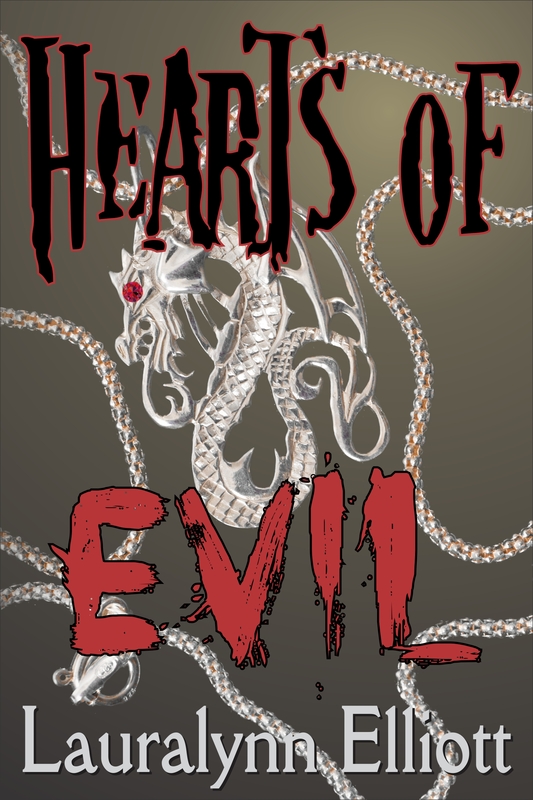 Just finished Hearts of Evil . . . .WOW!!! The creepy-factor in this book had me on edge! A brilliant horror!!! Thanks, Lynda! I was totally going for creepy!